Bon Scrapatit Designs: it's falling ... again! Just a quick in-and-out to let you know that I've had my head buried in Photoshop revamping a kit I was about to retire permanently. I did remove many of the original items, have added some new, as well as new papers and will have it all packed up and ready for you tomorrow ... uhm, lest another emergency present itself! ROFL! I keep falling for the deep, rich colors in this palette with the lighter hue of purple thrown in the mix and I hope you will find some use for it! I also hope you've all had a restful weekend and are re-energized and ready to take on the new week with gusto! my blogoversary and a sneak-peek! welcome to the world baby mylles! 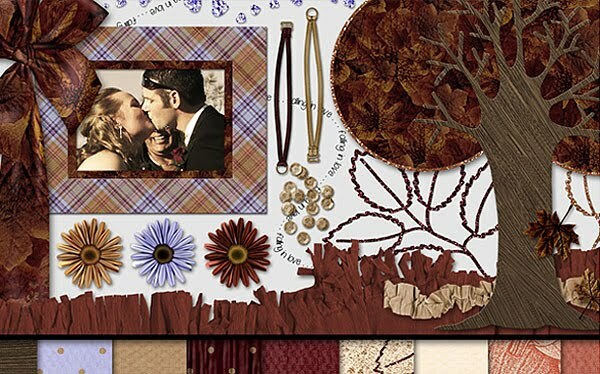 free "falling again" scrapkit has arrived!